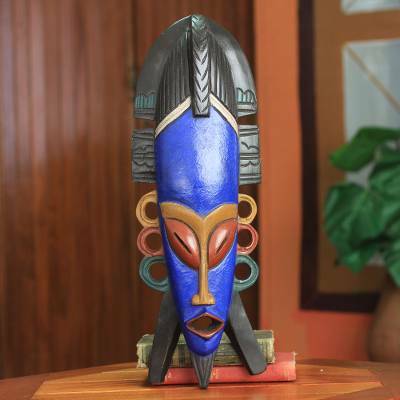 Original African Mask Carved by Hand, "Soyeya"
Ali Mohammed creates the original design of this mask which he names "Soyeya" a Hausa term that means "growing in love." "I want humanity to have love for one another, and grow in the love we have for each other," says the Ghanaian artisan. He carves the sese wood mask by hand featuring an ornate headdress that reaches under the jaw. Featuring an open mouth and closed eyes, the mask is further accentuated with hand-painted details in blue, black, orange, yellow, and green.